With the arrival of the fall season, a versatile and comfortable wardrobe is essential for the crisper days ahead. From early morning coffee runs to late night meetings, and everything in between, we have the perfect layering pieces to keep you cozy (and looking chic) all season long. Here are four ways to stay warm, and look cool, in layers. Bouclé continues to be the chunky fabric of the moment. It’s classic and refined. Add some textural luxuriance to a neutral ensemble with this pearl embellished bouclé blazer. Faux fur adds cozy chic bulk to your look when you throw it over any outfit – day or night – as the statement piece. 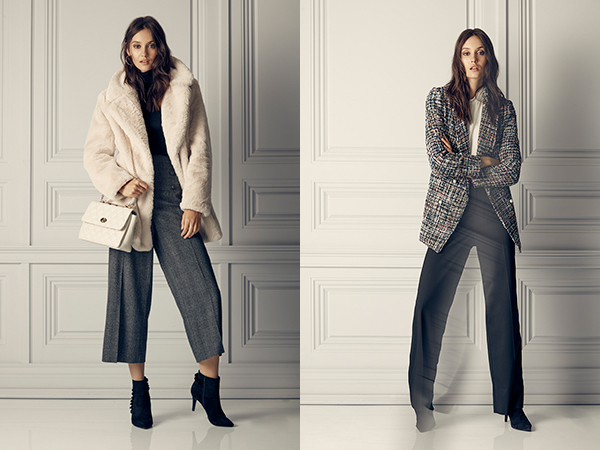 Balance the boldness of a faux fur coat with a streamlined turtleneck and some cropped trousers. Play with different lengths to add an unexpected twist to your look. Keep those shorter skirts on the fall rotation by pairing them with a long sweater coat. A cropped moto will look effortlessly stylish coordinated with a figure-flattering mini and knee-high boots. A timeless combination of pastel pinks and dove greys tops paired with a darker neutral bottom brings the soft, feminine glow closer to your face. Liven up a classic striped pant by contrasting your outfit with muted tones. Layer up with this blush hooded sweatshirt or this grey tweed blazer. Stylish footwear styles add a masculine edge to a classically feminine look. Step out in a daintier coat silhouette, such as this colour block sweater coat, matched with a more rugged shoe. Give this trend a go with a leather lace-up boot or a patent loafer. How do you walk your walk this season? Find your fall shoe mood with our quiz here.